The Black Pearl is featured prominently in each of Disney’s four Pirates of the Caribbean films. 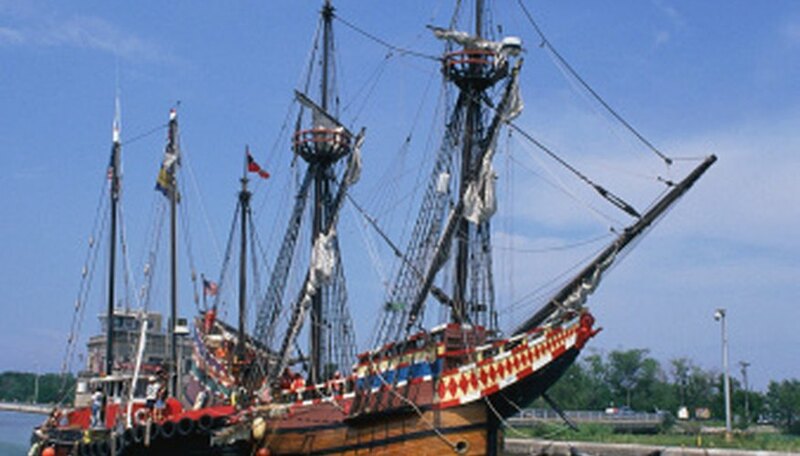 The quintessential pirate ship is bristling with cannons, black sails and 17th Century ornamentation. Making an accurate model of this evil ship entirely from scratch is a fun and rewarding challenge. Fortunately, the Internet is alive with pictures from which to work. The tools and materials needed to complete the project are easily found and inexpensive. Those tools, a good set of pictures and a little bit of skill are all you need to complete a sharp-looking Black Pearl of your own. Draw the outline of the Black Pearl onto a wood block. Use your reference drawing as a guide to the vessel’s shape. Begin with a side view, drawing it so that the stern (ship’s rear) meets one end of the block while the ship’s bow (front end) meets the other end of the long side of the block. Continue drawing the shape on the block, with a view from the bow, another from the stern, the opposite side of the ship on the other side of the block, and then a view from above, looking down at the deck. Your drawings all should match at the corners, so that you can see the shape of the ship as you rotate the block. Use the hand saw to “rough cut” the block into the Pearl’s shape. Begin with the bow facing you and cut the Black Pearl’s steep tumblehome, the slope that sweeps sharply inward from the waterline up toward the main deck. The Black Pearl features a high forecastle (the tall structure at the front of the ship), a high poop deck (the tall structure over the stern) and ornate balconies on the stern itself. Cut these features first from the profile view to establish their overall outline. The overhead view will allow you to cut the ship’s outline from that dimension. Curve the bow portions equally, cutting with the saw as closely as you can to the drawn lines. The ship will taper to a relatively narrow hull as you get closer to the stern. Refine the ship’s details using the chisel, knife and sandpaper. Clear away wood, and smooth the surface as close to the original outline as possible. You may need to redraw the outline on the wood as you go. In either case, refer to your drawings as you clean up the shape for an accurate outline. The more time you spend in carving those galleries across the Pearl’s stern, the more your model will stand out. Carve square indentations along the side to represent gun ports. Chop toothpicks into stubby cylinders for miniature guns to glue into the ports. Install the masts by cutting dowels to the mast height called for in your drawings and placing them on the deck at the appropriate locations. For ease of placement, first drill holes in the deck, using either a drill or knife. Although the actual ship built for the films did not feature topmasts, the upper half of each mast (the rigging was truncated at the top of the lower masts), models look better with “stepped” topmasts. Cut the upper half of the mast from the lower and glue the bottom half inch to the front of the top half inch of the lower mast. Install the bowsprit, the horizontal mast that sticks off of the bow. Black Pearl sports an unusually long, finely tapered bowsprit, which you can replicate by using a smaller dowel for the bowsprit and sanding it progressively narrower as you approach the tip. Rig the masts in place using thread. Masts were braced fore and aft (front and back) to one another and to the deck with thick ropes called stays. Use your reference drawing to determine where to place Pearl’s fore and aft stays. The shrouds, or stays that provided lateral support to the keep the lower masts perpendicular to the deck, can be wrapped around small nails or tacks driven into the side of the ship at the locations in your reference drawing. Use the smaller dowel to make yards, the horizontal poles that hold the sails and are suspended from the masts. Check your reference drawing for the locations in which to place them and for their proper lengths. Black Pearl featured black, shot-holed sails. Cut these from black fabric and drape them from the yards. Glue them along the top edge of the yard. Black Pearl was painted all black. Finish your model with black acrylic paint for a “movie realistic” look. In general, the more rigging you add, the more realistic your Pearl will look. Novelist, publisher and freelance writer John Reinhart began writing professionally in 1988. He brings more than 20 years of experience in customer service management, business journalism, marketing and education. Reinhart holds a Bachelor of Arts in communications from California State University, Chico.